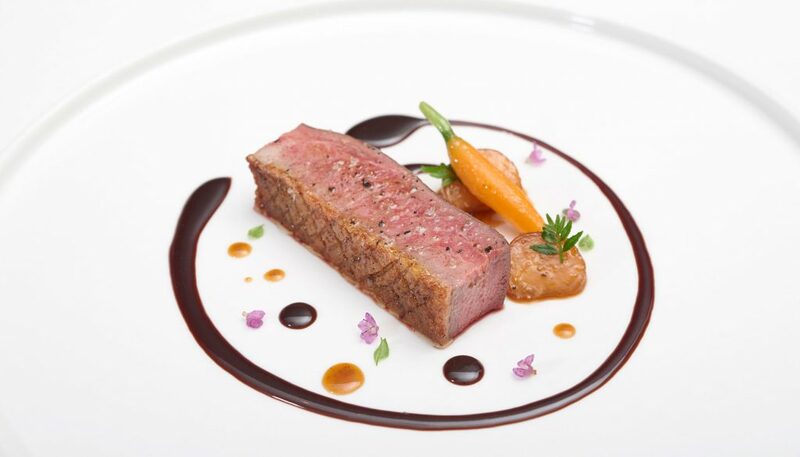 Restaurant Review: Will Bacchanalia on Hong Kong Street retain its Michelin star this year? 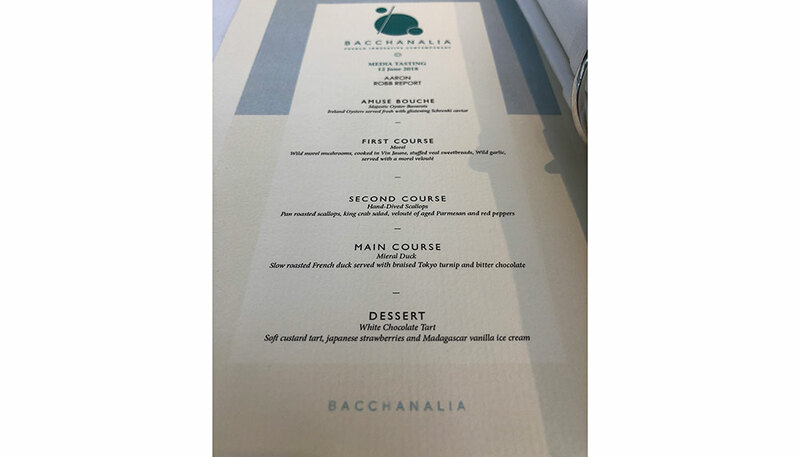 When I last dined at Bacchanalia in January 2017, chef Luke Armstrong had just taken over the kitchen of the one-Michelin-star restaurant in Hong Kong Street. A year later, the restaurant has come under new management – the Ebb & Flow Group – and boasts a fresh new look. It’s now brighter, airier and more open; in effect, more welcoming. 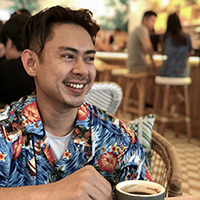 There’s also a new menu, with three set menu options each for lunch and dinner, as well as a five- or seven-course omakase menu. Before the revamp, the menu was less flexible, with one omakase selection each for lunch and dinner. What hasn’t changed, however, is Armstrong’s dedication to precision. He also hasn’t lost his tendency towards light and clean flavour profiles – important in a multi-course meal in order not to feel over-sated. I’m offered a special four-course tasting menu, which features dishes borrowed from all the menus. Currently in season: asparagus, wild ducks, morels and scallops. 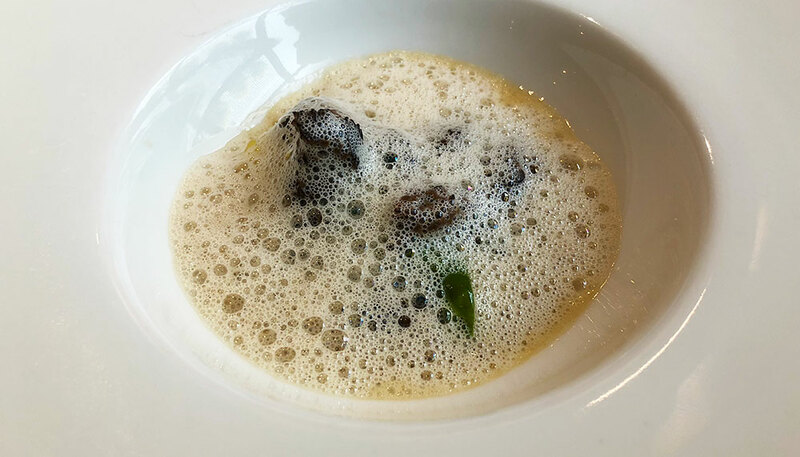 I begin with Morel, a dish that showcases wild morels from the Loire Valley in France. Roasted and deglazed with Vin Jaune and Madeira wine, the fungi are wonderfully sweet and tart. They would make a great dried snack, I imagine. But here they swim in a veloute made from Vin Jaune, which imparts a savouriness. Green asparaguses from Provence lend texture and fresh notes to the mix. The second course of Hand-Dived Scallops transports me from France to Japan. 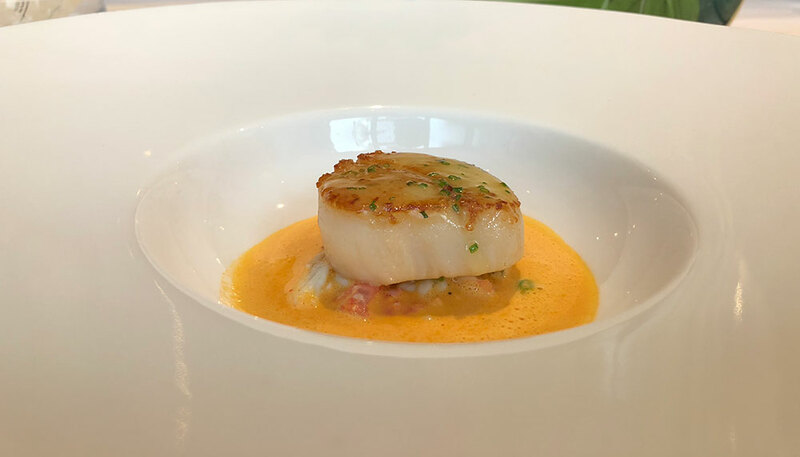 Sourced in Hokkaido, the scallops are pan-roasted to give a light crust that contrasts with the silky smooth flesh. The jus, made from 36-month aged parmesan, red peppers and lemon juice, is savoury, nutty, peppery, citrusy, and intense. I wonder, though, if it might be too robust for some palates. The third course, Mieral Duck, consists of two tantalising hunks of duck breast. It’s served with a baby carrot and a sauce made from bitter chocolate and the natural juices of the bird. On the side is a portion of duck consomme. The duck, I’m told, is a free-range bird from Mieral, one of France’s leading poultry suppliers. It has been aged for six weeks with all its innards intact to enhance the flavour and texture of the flesh. 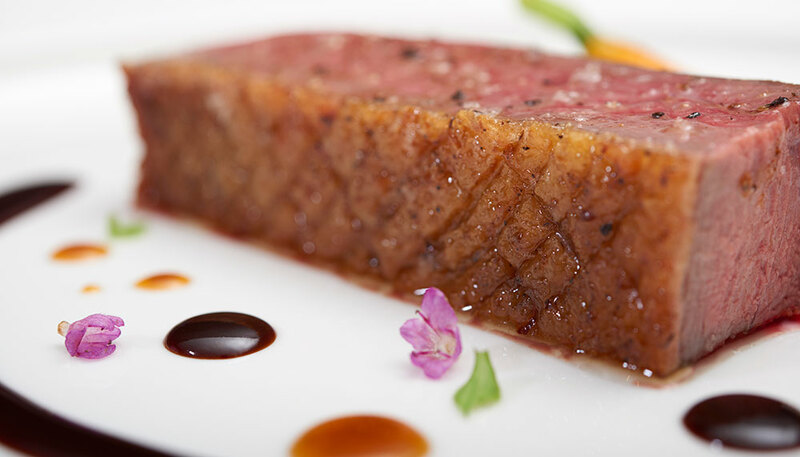 The breast meat is firm and dense – recalling the consistency of beef – and packed with natural flavours, while the crackling skin is reminiscent of crispy pork belly. Delightful. I find the consomme particularly intriguing. Its aroma and flavour is not unlike that of chicken essence, but what floors me is the lengthy five-day process it takes to prepare this deceptively simple concoction. Armstrong explains that different parts of the duck, various vegetables and duck stock is cooked until the portion is reduced to 75 per cent. The broth is then filtered eight times over the next few days, until a pure liquid forms. This is then fortified with Armagnac, resulting in a cocktail that consists of 70 per cent duck consomme and 30 per cent brandy. A White Chocolate Tart rounds off my meal. 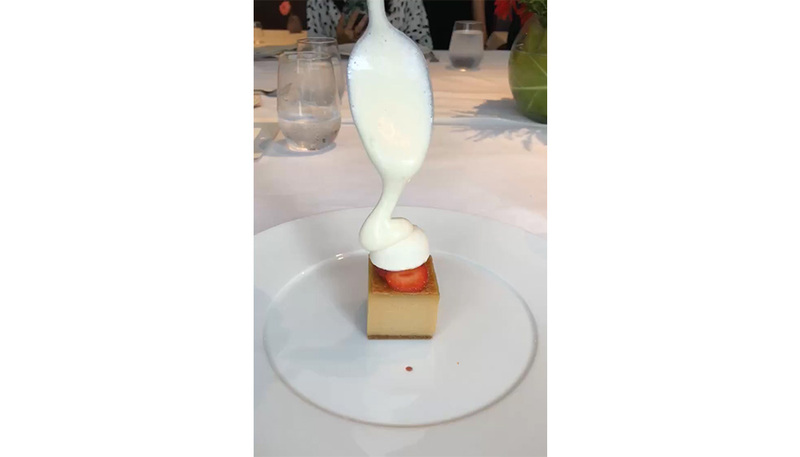 The caramelised white chocolate and cognac tart serves as a platform to showcase the other ingredients: Madagascar vanilla ice cream and Gariguette strawberries, a French variety that’s harvested early in the season. The ice cream is made from vanilla aged in Bourbon barrels for four years, which imparts an incredible nutty flavour and pronounced vanilla perfume. The dessert is rich, dense and aromatic. “The restaurant was very successful in its own right, but the direction was very different. To change it was important,” Armstrong explains.